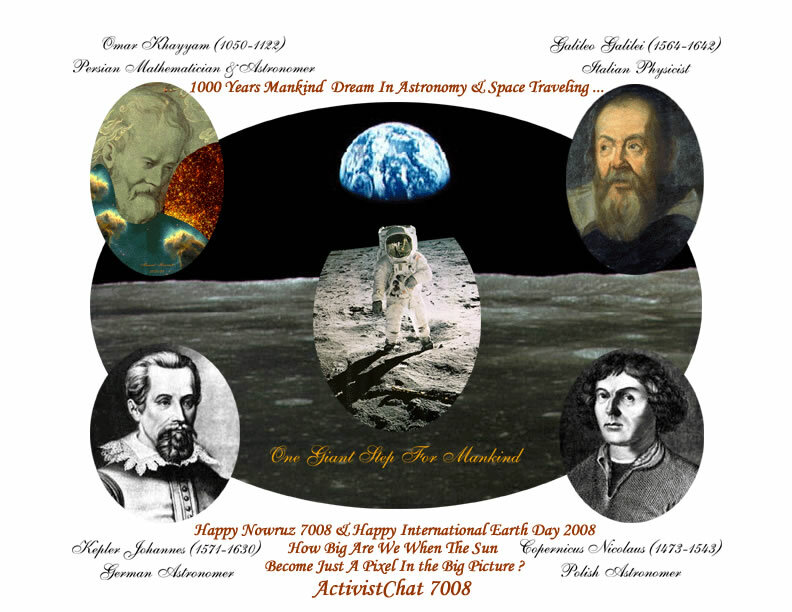 What is the International Earth Day ? 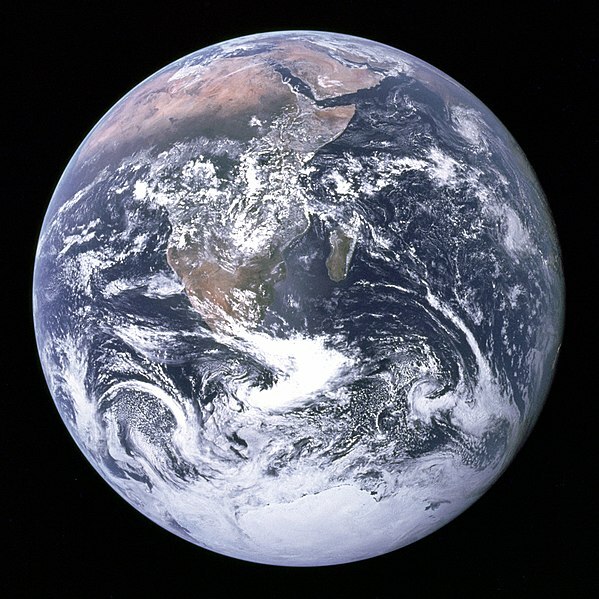 "The earth will continue to regenerate its life sources only as long as we and all the peoples of the world do our part to conserve its natural resources. It is a responsibility which every human being shares. 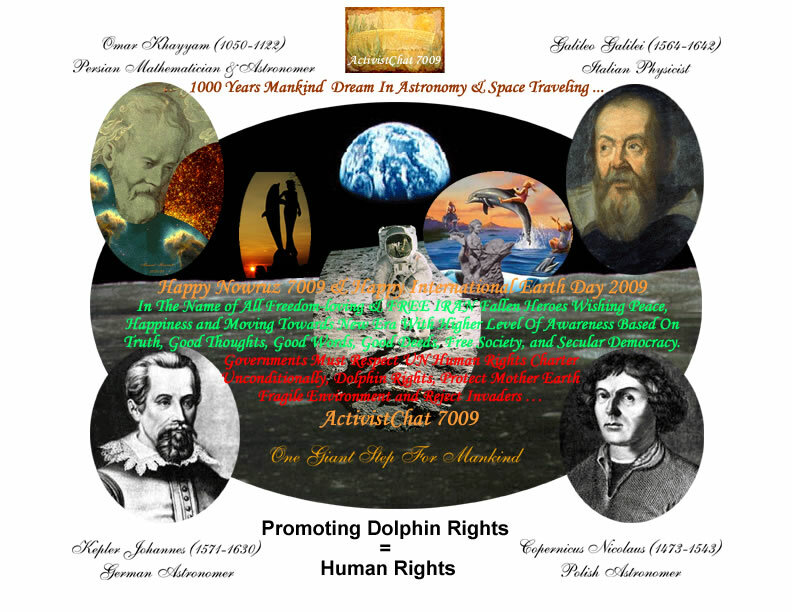 Through voluntary action, each of us can join in building a productive land in harmony with nature." 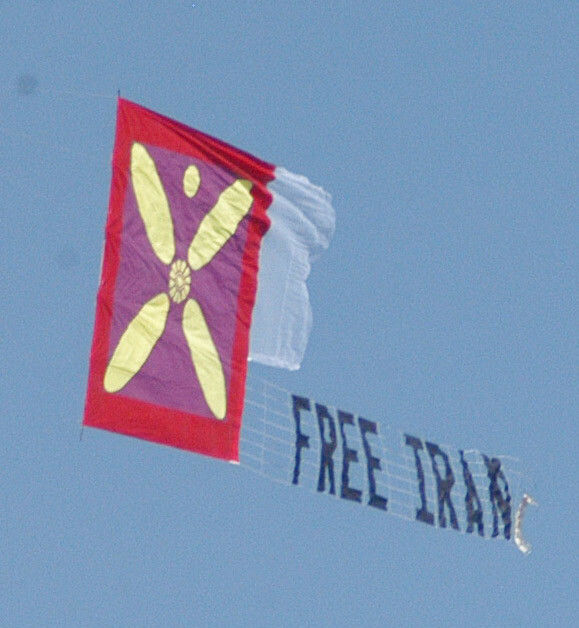 The Derafsh Kaviani will fly over Southern California parks during Sizdeh-bedar celebration on March 30, 2008. Fellow countrymen, Happy New Year! Just as our custom is to weave blades of grass on Sizdeh-bedar, let us weave together among us the bonds of unity and our culture and prepare for the victory that belongs to us. The Derafshe Kaviani is the ancient standard of the Iranian kings. It is the truest and oldest symbol of genuine Iranian culture. Today we fly it not only in celebration of the Iranian New Year, but in memory of Manochehr Farhangi, this peaceful soldier of true Iranian culture who died in this life to find his eternal place in the pages of the history of our land, a star blotted out from our sky to live forever in the pages of Iran�s history when it comes to be truly written. He was another soldier in the army of Yazdegerd III, the last true Iranian king. The battle of Qadesieh will go on till the foreign invaders are forcefully expelled from the land of Ahura Mazda. Our Iranian banner, the Derafshe Kaviani, was burned once, 1400 years ago, by the Omar Ibn Khattab under the standard of Islam. But our banner will rise from its ashes and fly over Southern California parks during Sizdeh-bedar celebration on Sunday March 30, 2008 just as it did last October 15, 2007 over the Statue of Liberty and the footprint of New York�s Twin Towers. Depiction of Derafsh -e- Kaviani based on Ferdowsi's descriptions in Shahnameh.The Derafsh-e Kavian (Deraf�-e Kāvīān, Middle Persian) was the legendary royal standard of the Sassanid kings. The banner was also sometimes called the "standard of Jamshid" (Deraf�-e Jamshid), the "standard of Fereydun" (Deraf�-e Fereydun), and the "royal standard" (Deraf�-e Kayr). The name Deraf�-e Kāvīān (Modern Persian: Deraf� Kāvīāni درفش كاويانى) means "the standard of the kay(s)" (i.e., kavis "kings") or "of Kāva." The latter meaning is an identification with an Iranian legend in which the Deraf�-e Kāvīān was the standard of a mythological blacksmith-turned-hero named Kāva (Modern Persian: Kāveh), who led a popular uprising against the foreign demon-like ruler Dahāg (Modern Persian: Zahhāk). Recalling the Sassanid-era legend, the 10th century epic Shāhnāma recasts Zahhak as an evil and tyrannical Arab, against whom Kāveh called the people to arms, using the blacksmith's leather apron on a spear as a standard. In the story, after the war that called for the kingship of Fereydun (Middle Persian: Frēdōn) had been won, the people decorated the apron with jewels and the flag became the symbol of Iranian independence and resistance towards foreign tyranny. By the late Sassanid era (224-651), a real Deraf�-e Kāvīān had emerged as the standard of the Sassanid dynasts. It was thus also representative of the Sassanid state - Ērānshāhr, the "Kingdom of Iran" - and may so be considered to have been the first "national flag" of Iran. The banner consisted of a star (the akotar) on a purple field, was encrusted with jewels and had trailing red, gold and purple streamers on its edges. The term akotar was significant since the star also represented "fortune", and the capture and destruction of the banner on a field of battle implied the loss of the battle (and hence the loss of fortune). Following the defeat of the Sassanids at the Battle of al-Qādisiyyah, the Sassanid standard was recovered by one Zerar bin Kattab, who received 30,000 dinars for it. After the jewels were removed the caliph Omar is said to have burned the standard. As the symbol of the Sassanid state, the Derafsh-e Kavian was irrevocably tied to the concept of Eranshahr and hence with the concept of Iranian nationhood. Thus, in 867, when the Saffarid "Yaqub Layt 'claimed the inheritance of the kings of Persia' and sought 'to revive their glory,' a poem written on his behalf sent to the Abbasid caliph said: 'With me is the Derafsh-e Kavian, through which I hope to rule the nations'." Although no evidence that Yaqub Layt ever re-recreated such a flag survives, star imagery in banners remained popular until the ascendance of the lion and sun symbol. derafsh as pronounced by the sherazi's and darafsh being the pronunciation of the rest of the dynasty that settled in tehran. Spectators fly the flag of pre-revolutionary Iran as they line Madison Avenue during the 5th annual Persian Parade Sunday, March 30, 2008 in New York. Participants fly the flag of pre-revolutionary Iran as they make their way down Madison Avenue during the 5th annual Persian Parade Sunday, March 30, 2008 in New York. Participants draped in the flag of pre-revolutionary Iran make their way down Madison Avenue during the 5th annual Persian Parade Sunday, March 30, 2008 in New York. 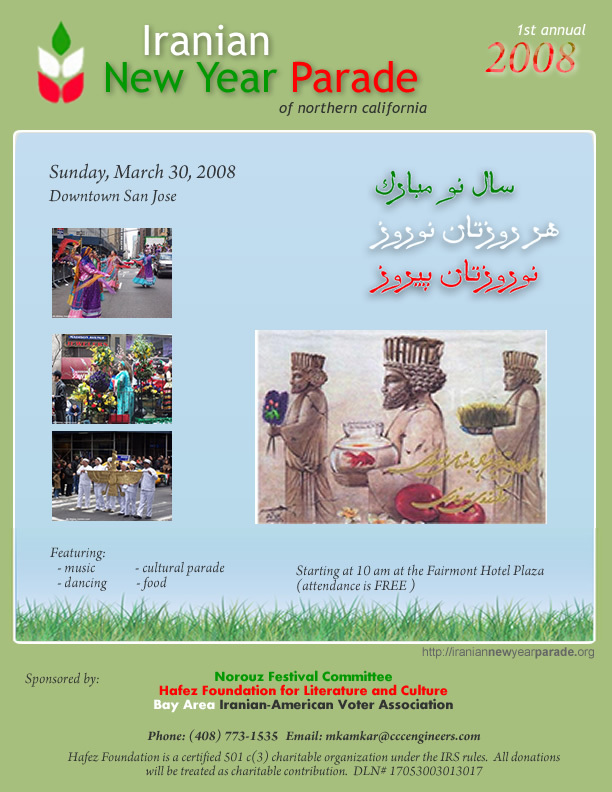 Norouz Festival Committee, the Hafez Cultural Foundation and the Bay Area Iranian-American Voter Association cordially invite you to come and enjoy the Norouz Festivities this year. Date and time: Sunday March 30, 2008 from 10 a.m. to 4 p.m.
Festivities include Parade followed by singing and dancing in the Park. 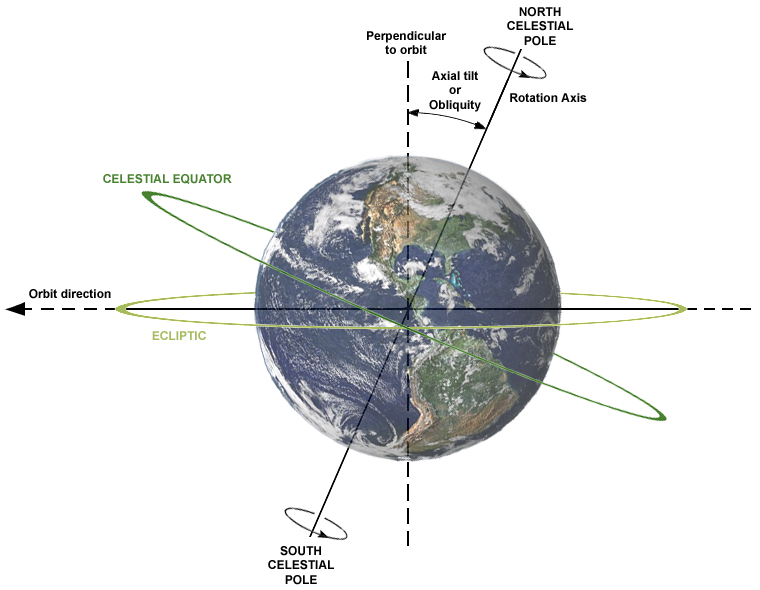 Date and time: Saturday April 5 and Sunday April 6, 2008 from 10 a.m. to 7 p.m. Entrance from Blossom Hill Road as well as University Ave.
Festivities include live concert by our own pop icon Rushid (confirmed) and other big names (being confirmed), professional dance groups, delicious Persian foods and family entertainment. For Sponsorship opportunities, including advertising and obtaining a booth at these events, please contact Mehran (Matt) Kamkar at (408) 999-0211 or mkamkar@cccengineers.com . Note: Hafez Cultural Foundation and the Bay Area Iranian-American Voter Association are certified 501(c)(3) charitable organizations under the IRS rules. Donations are considered to charitable contributions. Peres spoke in Hebrew for most of the blessing, but then ended his address with a traditional Persian holiday greeting in Farsi: "May your Nowruz be a victory, and every day be Nowruz!" "I think the Iranian nation will topple these leaders. Leaders that do not serve the people will, in the end, the nation will get rid of them," Peres said in the interview. "On the eve of the new year, I appeal to the noble Iranian people on behalf of the ancient Jewish people and urge them to reclaim their worthy place among the nations of the enlightened world," Peres said. برخلاف آن رژیم، برای ایرانیان آرزوی نیک داریم. پرزیدنت شیمعون پرس رئیس جمهوری اسرائیل با فرستادن پیام ویژه ای خطاب به ایرانیان، فرا رسیدن نوروز 1388 خورشیدی را به همگان شادباش گفتند و آرزو کردند که سال پیش رو، برای مردم با فرهنگ ایران، سال شادکامی و رسیدن به آزادی انسانی باشد. پرزیدنت پرس پیام خود را با جمله ای به زبان فارسی آغاز کرد و آن را به زبان فارسی پایان داد. ایرانیان عزیز روز نو و نوروز باستانی به شما خوش باد. جشن باستانی شما، عید نوروز را شادباش می گویم. عید نوزائی که شادمانی و امید به دنبال دارد و روز نوئی می آورد، روزها تازه ای را نوید می دهد و سال جدیدی را به دنبال دارد که سال پر برکت باشد. خوشا به حال شما که چنین عید باستانی دارید که نسل بعد از نسل آن را پاسداری کرده و جشن گرفته اید. ملت اسرائیل یادبودهای تاریخی گرانبهائی از دوران هائی دارد که ایران در هر زمینه شکوفا بود و از جمله منشور حقوق بشر کورش کبیر را به جهانیان اهدا کرد و به ملت اسرائیل حق بازگشت به وطن خویش را به ارمغان بخشید و به این قوم امکان داد از اسارت امپراطوری بابل آزاد شود و به اورشلیم باز گردد تا بتواند بیت المقدس خود را از نو بنا کند. به پاس این بزرگ منشی، ملت ایران و سرزمین ایران جایگاه ویژه ای در میراث تاریخ یهود دارند. ولی حتی در عصر حاضر (و نه تنها در قرون باستان) روابط ایران و اسرائیل از دوران شکوفائی و برکت برخوردار بوده است. دورانی که ما اسرائیلیان تجربیات خود در زمین کشاورزی، صنعت، دانش و علوم، پزشکی و غیره را با شما ایرانیان در میان گذاشتیم و کوشیدیم بهترین روابط را با شما برقرار کنیم. شوربختانه مناسبات دو کشور، امروز در تیره ترین سطح خود قرار دارد- این وضع ناشی از نیت های ناپاک رژیم ایران است که می کوشد از هر طریق ممکن علیه کشور اسرائیل و مردمان آن به اقدام بپردازد و اسرائیل را حتی به نابودی تهدید می کند. شما پروردگار را باور دارید و ما نیز یزدان را می پرستیم. پروردگار زندگی و حیثیت، و نه خداوندگار کینه و کشتار. من تردید ندارم که دور نیست آن روزی که روابط همزیستی بین دو ملت به وضع پیشین خود باز گردد و آن همکاری های سازنده بین دو ملت دوباره در همه زمینه ها شکوفا شود و در خدمت دو ملت و در راه آینده مشترک دو کشور قرار گیرد. در این ایامی که رژیم کنونی در ایران سخن از انهدام اسرائیل می گوید، ما آرزوی شکوفائی و نیک بختی مردم ایران را داریم. ما کورش کبیر را به یاد داریم که در کتاب مقدس تورات با نام منجی پروردگار از او اسم برده شده است و به یاد داریم که یهودیان قرن ها و نسل ها در ایران ساکن بودند و در سازندگی کشور شما نقش داشتند و در راه اعتلای تمدن ایران زمین و فرهنگ یهود گام برداشتند. ما امیدواریم و مطمئن هستیم که پلیدی و شرارت بالاخره از جهان رخت برخواهد بست. در راه نیک بختی همه ملت های جهان و مردمان دنیا، حتی اگر ابنای بشر با هم تفاوت و دگرگونی دارند، دلیل آن نیست که یکی دیگری را مورد تهدید قرار دهد، یا کسی از دیگری تنفر داشته باشد و یا درصدد نابودی او برآید. در آستانه سال فرخنده نو، من به ملت فرهیخته ایران روی آورده و توصیه و درخواست می کنم که به اصالت باستانی خویش باز گردد. من به نام امت باستانی اسرائیل، برای ملت کهن زمان ایران آرزو می کنم که هر چه زودتر جایگاه شایسته و والای خویش را در میان کشورهای فرهیخته جهان باز یابد و دوباره از احترام برخوردار گردد و مورد تنفر قرار نگیرد و همان گونه که در گذشته به فرهنگ جهان خدمت کرد، دوباره در آن نقش سازنده ای به عهده گیرد - و همان گونه که درگذشته مصدر خدمات جهانی بود، درآینده نیز دوباره در این راه گام بردارد. نوروزتان پیروز و هر روزتان نوروز باد! 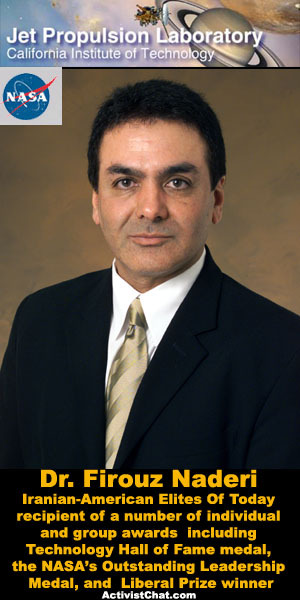 Thank you for your positive Nowruz message to Iranian People, Iranian-American community and praising non-Islamic features of Iranian civilization and innovations and their pre Islamic contributions to history of mankind. - The second occupation of Iran By Muslims and Arabs happened again with the revolution 1978. Great majority of Iranian people and Iranian-American community reject referring to Iran as "Islamic republic of Iran" and legitimizing the Islamist Terror and Torture masters. President Obama, you have two clear choices: Stand behind freedom-loving Iranian people, Iranian-Americans with over 95% majority and fully support them to fight for FREE Iran, freedom, Free Society, secular democracy and human rights or deal with the Islamist Mafia invaders and Occupiers of Iran who is in control of the Oil money with mercenaries security forces who have taken Iranian nation as hostage in past 30 years. OMID blogged about traditional Persian music and culture, not politics.